Do you believe Jesus Christ of Nazareth rose from the dead, or do you think the resurrection is only a legend? If you are a doubter, what you are about to read might surprise you. 1. Legends take time to develop and become embellished in the retelling, but the news of the risen Christ sprang up right away. It takes several generations for myths to develop into their final forms, whereas within a short time the news Jesus rose from the dead spread throughout the Roman empire. 2. Over 500 witnesses encountered the risen Christ. After His resurrection, Jesus Christ appeared to His followers for forty days. At one time He appeared to over five hundred people at one time. Many remained alive years later after the resurrection to tell their own personal stories about seeing the living Christ. The number of witnesses in trials today is crucial. If you paraded five hundred eyewitnesses of a murder in a court of law before a jury, they would find the accused guilty due to the sheer number of eyewitnesses. 3. The death and rebirth of mythical gods is a foreign concept to Jews. The first Church was Jewish, and they are monotheists. Why would they accept as their Messiah a criminal crucified on a Roman cross? 4. 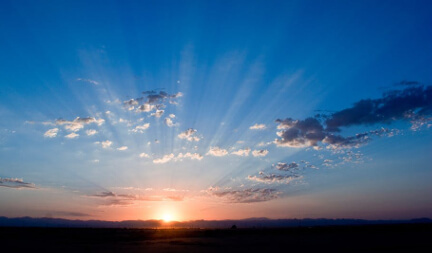 There is no description of the resurrection itself in the Bible. If the resurrection is a legend, the creators would describe such a miraculous event in glowing details. 5. The first witnesses to the resurrection were women. But the testimony of women didn’t count in Roman or Jewish courts in that day, so why would a legend revolve around women instead of men? If the resurrection is a legend, why would the people who started it want women to be the first witnesses? The apostles were hiding from the Jews in fear of their lives, but the courageous women put the frightened men to shame. This was a patriarchal society. If people concocted a myth about the resurrection, would they invent brave women and cowardly men in a man’s world? 6. One of the prime witnesses, Mary Magdalene, didn’t even recognize Jesus when she first encountered the risen Savior. She observed nothing special about Jesus’ resurrected body. Mary thought He was a gardener! Does this sound like a legendary hero? 7. Why would Christians be willing to die for a lie? Thousands of believers died horrible deaths. Some were covered with oil as human torches and lit to light Nero’s garden rather than deny Christ. Thousands still die for Him today. Yes, Jesus did rise from the dead! Millions have received new lives in Him. Why not you? Trust Him and live forever! “For I delivered unto you first of all that which I also received, how that Christ died for our sins according to the scriptures; And that he was buried, and that he rose again the third day according to the scriptures: After that, he was seen of above five hundred brethren at once; of whom the greater part remain unto this present, but some are fallen asleep (1 Corinthians 15:3-6). Have you ever been hiking outside enjoying the fresh air when suddenly an exquisite butterfly visits you? 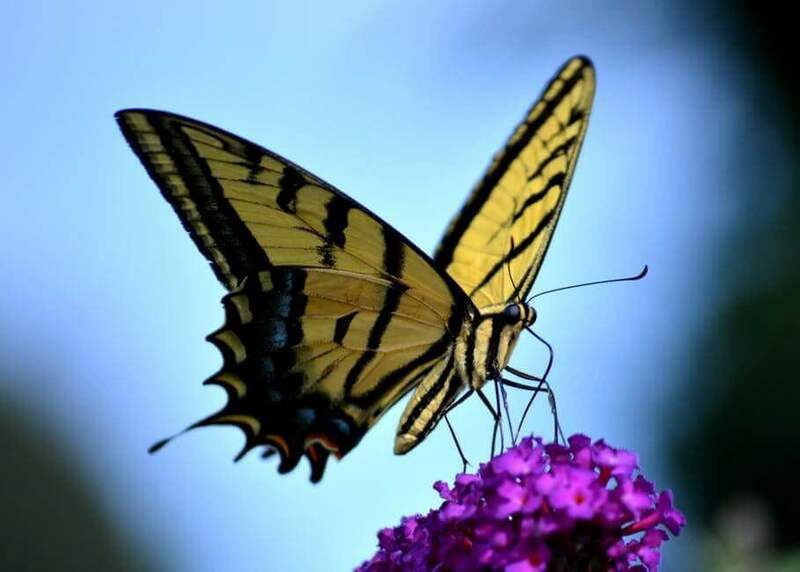 What a treat it is watching these shimmering creatures flit from flower to flower flashing brilliant shades of yellow, orange, and all the colors of the rainbow– depending on what type of butterfly you see. 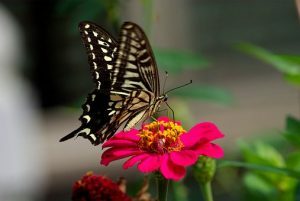 The special hand of the Creator God can clearly be seen in the metamorphosis of a butterfly. Even strong believers in evolution can experience a twinge or two watching the amazing change from a caterpillar to a butterfly as it emerges from its cocoon after being tucked away from the watchful eye during the amazing stages of metamorphosis. Darwin had his own ideas of how all life came into being. He believed a process known as natural selection was responsible for all the humans, animals and plants that have ever existed. Darwin thought that natural selection worked through a series of slight modifications over millions of years. However, Darwin was certain that there were no examples to contradict what he believed. 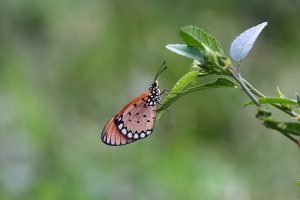 Although he felt he had never seen an example to refute his ideas, consider that the butterfly is proof of dramatic change without slight modification. A caterpillar does not simply grow wings while tucked safely away in his little cocoon, he changes completely. He loses six legs and three segments of his body. This would be enough to rebuke the theory of a slight modification, yet the butterfly’s story doesn’t end there. Its number of eyes decreases and a sucking tube replaces his jaw! Then add to the total amount of changes reproductive capabilities. All this is more than slight modification– even before you take into account his new set of wings. The butterfly is set about in this world as a completely different creature than he began, and it is not by chance nor by adaptation that this occurs but through intentional design. The butterfly’s journey from larvae to adult is a proven solid argument for creation. When a caterpillar becomes a butterfly, his entire purpose changes. The caterpillar is rather destructive. While he is food for birds and other creatures, he feeds on trees and plants, often destroying their beauty. Once he turns into a butterfly, however, his entire intention changes as now he is responsible for the germination of plants and flowers. Thus, this is proof that the radical undertaking the caterpillar goes through during metamorphosis is not about adaptation, but about creation in its entirety. When a caterpillar sleeps in his cocoon and then later emerges as a butterfly, this also reminds us that the same thing can happen to us spiritually as well as physically, but in a different way, of course. When we arrive into the world, the Bible says we are dead in trespasses and sins and need to experience spiritual life. Second Corinthians 5: 17 states that whoever is IN Christ is a new creation! Jesus said we must be born again. He also said He would come again and those who trust Him, who are alive at his coming, won’t die but will be changed in an instant at the last trumpet. However, if the Lord Jesus doesn’t return before we die, believers’ bodies will be raised from the dead! Those who trust in the Lord will have bodies like the resurrection body of Jesus Christ. Wow! What a metamorphosis that will be! The Bible tells us we have all sinned and fall short of the glory of God. For example, one of the ten commandments commands us not to lie. There is a penalty attached to breaking any part of God’s Law. It is death. In Romans 6:23 we read that the wages of sin is death, but the gift of God is eternal life through Jesus Christ our Lord. Jesus died on the cross to take the punishment we deserve for breaking God’s Law. He was buried but rose again from the dead on the third day. 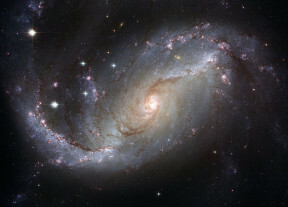 Did the universe appear by chance? With a big bang and amoeba’s romance? God created all . . . A truth old—yet ever new.